The refurbished Late 2013 Retina IG Macbook Pro provides serious bang for the buck. Especially at GainSavers super low prices! The discount used Macbook Pro has it all  15.4-inch Retina display, Quad Core i7 processor with Intel Iris Graphics (IG), flash storage, two Thunderbolt 2 ports and super fast 802.11ac Wi-Fi. With GainSavers 30 Day Money Back Guarantee, you can order with confidence knowing that youre getting a great deal on a fully tested Macbook Pro configured to your specifications. The Late 2013 refurbished Macbook Pro gets its high performance from the fourth generation Quad Core i7 processor running at 2.0GHz. When needed, Turbo Boost speeds up the processor to 3.5GHz. Hyper-Threading technology in the Quad Core i7 processor is able to handle multiple tasks at once in each core. With all this technology built into the Intel i7 processor, youll notice your most power-hungry applications fly like never before. This used Mac laptop is an "IG" Macbook Pro. This mean it has the Iris Graphics accelerator built into the fourth generation Intel processor. Iris Graphics adds an additional 128MB of embedded memory that acts as an ultrafast processor cache. Graphics intensive programs run almost twice as fast with Iris Pro. The discount Late 2013 Macbook Pro supports the 802.11ac wireless standard, which is three times faster than the earlier 802.11.n wireless found in previous Macbook Pros. This means your fast Quad Core i7 Macbook Pro wont be waiting around for data from the internet. Youll enjoy faster downloads and web pages that pop into your browser in the blink of an eye. And if do any online gaming, faster wireless speeds will give you a totally unfair advantage! Not only is your wireless faster in the used cheap Late 2013 Macbook Pro, but all your connections will get a boost from its two Thunderbolt 2 ports and two USB 3 ports. The Thunderbolt 2 connector is twice as fast as the original Thunderbolt. It provides 20Gbs of data transfer bandwidth to every device you have connected. You can daisy-chain up to six devices to each Thunderbolt 2 port, for a total of 12 separate devices. 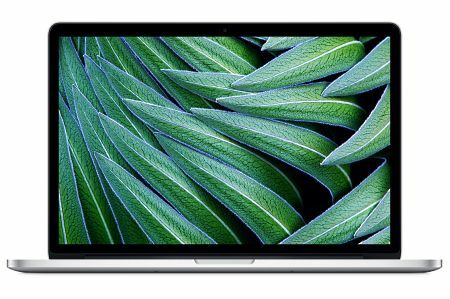 If you need to connect to a massive amount of data storage, now you can with the discount 15.3-inch Macbook Pro. When you shop at GainSaver, you can take advantage of our exclusive customization options available in the GainSaver Configurator. You can get exactly the Macbook Pro you need just by picking from the menus. Do you run software that requires an older operating system? Do you want a dual operating system with Windows? We can do it for you. Need more storage? Just select the hard drive capacity you need and your Macbook Pro will be delivered with it pre-installed for you. Its a fast and affordable way to bring your Macbook Pro up to your system requirements. Click the Buy Now button once you have made your selections in the Configurator.